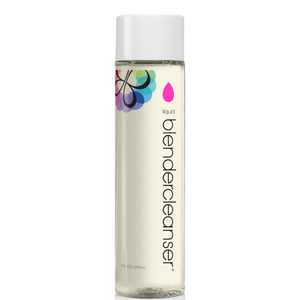 Give your favorite sponge a bath with this newly-formulated Liquid Blendercleanser. Made especially for soaking out tough stains, the demineralized water and natural sea salt are earth-friendly and keep your Beautyblender - and brushes - squeaky clean. Using a damp Beautyblender, press on the pump nozzle, distributing cleanser onto the surface of the sponge. 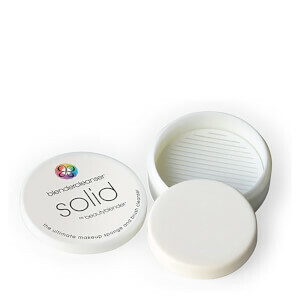 Lightly squeeze and work into a lather. Rinse and repeat, if needed. Remove any excess water and place Beautyblender on insert pedestal for drying or in a clean ventilated area. Works miracles on soaking out tough stains, as well. Best brush cleanser I've ever used, BY FAR. I use a powder foundation every day. However, I put this over either a facial oil, sticky but fabulous facial serum, and/or mineral sunscreen. My brush gets gunky fast, and special brush sprays, several other cleansers, as well as even oil removing dish soap fail to get my brush soft and clean (especially deep in the center of the brush). The central/interior bristles always remained somewhat glued together, even with 2-3 passes of soap and water.Then I received a sample of this blendercleanser with a recent Skin Store purchase. I seriously could not believe how quickly and well it worked to clean my brush, including the center. One wash, and my brush is like new. If it sounds like hyperbole, that is because I am so excited by how wonderful this product is.